In his autobiography, Long Walk to Freedom, former president Nelson Mandela writes about how the decision was made to use Duma Nokwe as the only advocate in the Treason Trial. He reveals here how the trialists managed to function without their lawyers for more than five months, under the State of Emergency. "ON 25 April , the day before the trial was to resume, Issy Maisels called us together to discuss the grave effect the State of Emergency was having on the conduct of the trial. Because of the Emergency Regulations, consultations between the accused and our lawyers had become virtually impossible. Our lawyers, who were based in Johannesburg, had trouble seeing us in prison and were unable to prepare our case. They would often drive up and be informed that we were not available. Even when we were able to see them, consultations were harassed and cut short. More important, Maisels explained that under the Emergency Regulations, those already in detention would be exposing themselves to further detention merely by testifying, for they would inevitably make statements regarded as 'subversive', thereby subjecting themselves to greater penalties. Defence witnesses who were not imprisoned now risked detainment if they testified. "The defence team proposed that they withdraw from the case in protest. Maisels explained the serious implications of such a withdrawal and the consequences of our conducting our own defence in a capital case. Under the hostile atmosphere at the time, he said, the judges might see fit to give us longer terms of imprisonment. We discussed the proposal among ourselves, and each of the twenty-nine accused - we were now minus Wilton Mkwayi - was able to express his opinion. The resolution was unanimously endorsed, and it was agreed that Duma Nokwe and I would help in preparing the case in the absence of our lawyers. I was in favour of this dramatic gesture, for it highlighted the iniquities of the state of emergency. On 26 April, Duma Nokwe, the first African advocate in the Transvaal, rose in court and made the sensational announcement that the accused were instructing defence counsel to withdraw from the case. "On 26 April, Duma Nokwe, the first African advocate in the Transvaal, rose in court and made the sensational announcement that the accused were instructing defence counsel to withdraw from the case. Maisels then said simply, 'We have no further mandate and we will consequently not trouble Your Lordships any further,' after which the defence team silently filed out of the synagogue. This shocked the three-judge panel, who warned us in direct terms about the dangers of conducting our own defence. But we were angry and eager to take on the state. For the next five months, until the virtual end of the Emergency, we conducted own defence. "According to South African law, since we were in the Supreme Court, Duma, as an advocate, was the only one permitted to address the judges direct. I, as an attorney, could instruct him, but I was not technically permitted to address the court, and neither were any of the other defendants. We dismissed our advocates under the correct assumption that an accused, in the absence of representation, would be permitted to address the court. I addressed the court and Justice Rumphff, trying to frustrate us, interrupted me. 'You appreciate the fact, Mr Mandela,' he said, 'that Mr Nokwe, as an advocate, is the only lawyer who is permitted to address the court.' To which I replied, 'Very well, My Lord, I believe we are all prepared to abide by that as long as you are prepared to pay Mr Nokwe his fees...' From then on no one objected to any of the accused addressing the court. "While Farid was questioning Helen and the subsequent witnesses, Duma and I sat on either side of him, supplying him with questions, helping him to deal with legal issues as they arose. In general, he did not need much prompting. By one day, when we were under constant pressure, we were whispering suggestions to him every few seconds. Farid seemed weary, and Duma and I were running out of material. Then, without consulting us, Farid suddenly asked the judges for a postponement, saying he was fatigued. The judges refused his application, saying it was not sufficient reason for a postponement and reiterating the warning they gave us the day our lawyers withdrew. "That afternoon there was no singing as we returned to prison, and everyone sat with sullen faces. A crisis was brewing among the accused. Upon our arrival in prison, a handful of them demanded a meeting. 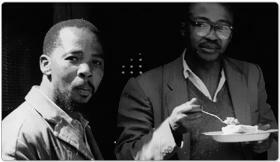 I called all the men together, and J Nkampeni, a businessman from Port Elizabeth who had helped out the families of defiers during the Defiance Campaign, led what turned out to be an attack. "A substantial number of men shared Nkampeni's misgivings. I warned them against the dangers of being disheartened and insisted that we were doing quite well. I said that today was a minor setback, and that we would face worse difficulties. Our case was far more than a trial of legal issues between the Crown and a group of people charged with breaking the law. It was a trial of strength, a test of power of a moral idea versus an immoral one, and I said we needed to worry about more than the legal technique of our advocates. The protest abated. "After Helen Joseph had been cross-examined and re-examined, accused No. 3, Ahmed Kathrada, opened his case. It was during the testimony of Kathy's second witness, accused No. 4, Stanley Lollan, a member of the executive of the Coloured People's Congress, that Prime Minister Verwoerd announced that the State of Emergency would soon be lifted. The Emergency had never been intended to be permanent, and the government believed that it had successfully stifled the liberation struggle. At this point our defence lawyers returned, to the general relief of all of us, though we remained in prison for another few weeks. We had been kept in detention and had functioned without our lawyers for more than five months."